When Moses approached the burning bush, in Exodus 3, the Lord spoke to him and said, "Take off your sandals, for the place where you are standing is holy ground" (v. 5). Moses was in the presence of God. 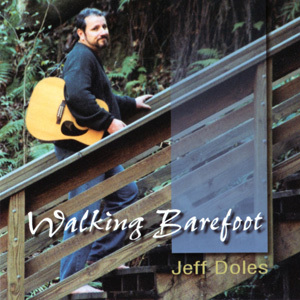 "Walking barefoot" is about learning to recognize that we, too, are in the presence of God. "Walking barefoot," from beginning to end, is a prayer soaked process. In this first song, we commit ourselves to the glory of God (Ps 51.15), calling on the Lord to assist us (Ps 70.1), that the words of our mouths and the meditations of our hearts might be pleasing to Him (Ps 19.14). In the mystery of the Christian life, we are called to walk the horizon line between the physical and spiritual realms, to fully embrace both realities. In the metaphor of this song, it is a "walk on the edge of the world," a "dance on the rim of the sea." In my own walk as a Christian, I have learned to trust in two unshakable truths: God is strong, and God is loving (Ps 62.11,12). Let not the rich man glory in his riches. Let not the poor man be ashamed of his poverty. But let them both come humbly and glory in the Lord, who is both powerful and compassionate. St. Francis of Assisi is a paradigm for us as we strip away our dependence upon material things and the values of the world and learn to walk with God in humbleness, simplicity and freedom. Franky is but one of a long line of prophets and lovers, in search of God's kingdom (Matt 6.33) and a city whose builder and maker is God (Heb 11.16). They are lovers of God and of all who passionately seek after God's Spirit — wherever He leads. And they invite us to join their number. This song, based on a prayer of St. Augustine, in his Confessions, is about how we join in on this "barefoot" journey. It is a song of repentance, confessing the smallness of our souls and calling on God to "enlarge the borders of my heart and make it new." God has given us many signposts along the way. One of them is baptism, a sign from God that we are embarking in newness of life on a journey with God and His people. God has also given each of us His own Holy Spirit, to guide and teach us, to help us pray, to witness within that we are truly the children of our "Abba, Father," and to glorify the Lord Jesus Christ in us and through us. In the Lord's Supper, we are in special fellowship with the Crucified and Risen Savior and with each other. It is indeed a celebration, a most important signpost for our journey. Like Moses at the burning bush, we, too, must take off our shoes when we realize that we are on holy ground. And in the Christian life, everywhere we place our foot is holy. When we look with the eyes of faith, God shows Himself in our lives and in our world in ways both powerful and quiet. Adapted from a centuries-old prayer, the text of this song is simple: "Jesus, Son of God, have mercy on us." It leads us into a contemplative experience, a humble reliance upon the goodness and mercy of Christ, a simple enjoyment of His loving presence. The repetition reminds us that each step of our journey is a step taken with Christ.